The Greater Monmouth Chapter of the Armed Forces Communications & Electronics Association (AFCEA) International has long been tied to the Fort Monmouth community. Even with the closing of the Fort under the 2005 Base Realignment and Closure (BRAC), the Chapter continues to support the local community. We are a member-based, non-profit, international organization that provides a forum for military, government and industry communities to collaborate so that technology and strategy align with the needs of those who serve. We have helped members advance information technology, communications and electronics capabilities since 1946. The association has 139 chapters (including Student chapters) with over 30,000 individual members across the globe. Our Greater Monmouth Chapter of AFCEA is honored to be included as a Community Partner of the AUSA Monmouth Chapter. We look forward to mutually supporting our organizations in the years to come. Our local AFCEA Chapter holds luncheons with speakers that are of interest to its membership, supports the Department of Veterans Affairs including their North Jersey Stand Down Day and the VA2K Walk and Roll and supports the Fort Monmouth Economic Revitalization Authority’s (FMERA) Fort Monmouth Redevelopment effort. In addition, we support the Tri-Service National Junior Science and Humanities Symposia (JSHS) Program that includes the regional Jersey Shore Junior Science Symposium (JSJSS) and provide Awards and Scholarships to local high school students. On February 6, 2018, we hosted a luncheon at the Doubletree Hotel in Eatontown, NJ that featured Michele Foster, Associate Executive Director of the VA Technology Acquisition Center (TAC), who facilitated a Contracting Officer Panel on Best Practices & Acquisition Strategies of the VA TAC. On May 3, 2018, AFCEA hosted a VA Benefits Workshop with the Department of Veterans Affairs in Middletown, NJ. We are planning another similar event in the Fall of 2018 for Veterans, service members and dependents looking for information about VA benefits. We partner with local business organizations in the community and will participate with the Eatontown Industrial Park Association (EIPA) for their Day at the Races event to take place at the Monmouth Park Racetrack in Oceanport, NJ on August 24, 2018. 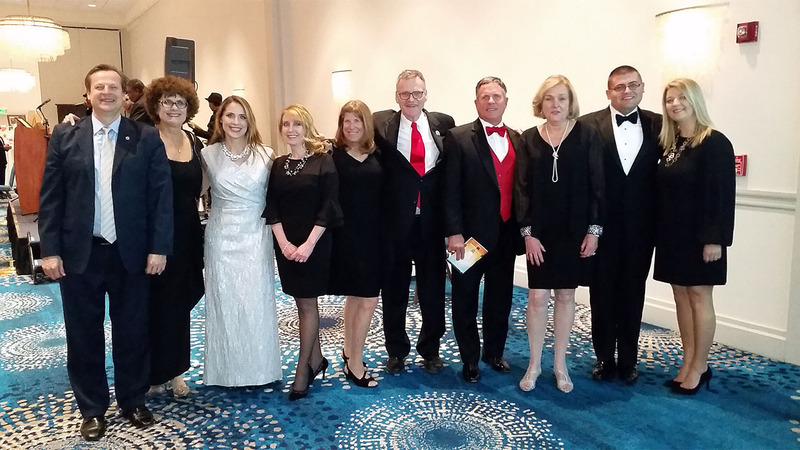 We partnered with the AUSA Monmouth Chapter to co-host the Gingerbread Ball in December 2017 and will again co-host the Ball this year to take place at the Ocean Place Resort & Spa in Long Branch, NJ on December 1, 2018. Watch our website at https://greatermonmouth.afceachapters.org for future events, lunches and seminars that we host for our members. All are open to the public. Contact our Board Member and VP of Membership, Chuck Strimpler, for membership details at [email protected].